MISAO project aims to make much use of images taken all over the world for searching and tracking astronomical remarkable objects. Minor Planet (32200) 2000 OT2, discovered by Yasukazu Ikari on July 28, 2000, is named as Seiicyoshida. It is observable at 16.5-20 mag. 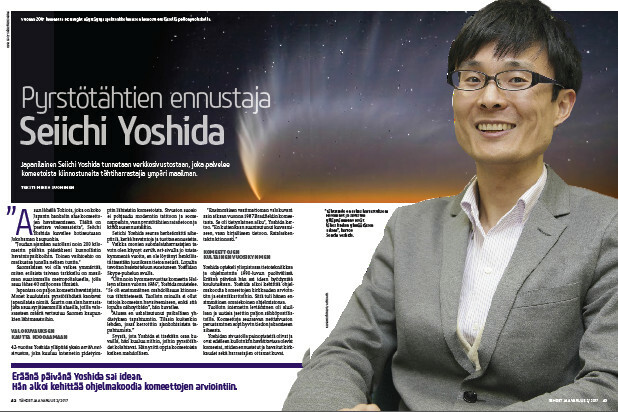 The "Tahdet ja avaruus -magazine" (Stars and Space, Finland) kindly made an interview and pubslished an article to introduce me in 2017 February. The photo is taken by 'Hoshinavi / AstroArts'.